Moving to our new beach house has been an exciting journey. We finally got to live in our dream location, but were faced with the real challenge of it not being our dream home. The house is a 100-year-old beach bach – small, dark and sandwiched in-between the neighboring houses in Lyall Bay, Wellington, New Zealand. Our creative vision for the kitchen and living room renovation was to open it up as much as possible, create light reflecting surfaces to produce an optical illusion of a bigger, lighter and airy space. I actively used every tip in a previous blog post of 'how to make a room look bigger' to make the best use of our limited space. With our design aesthetic we have tried to respect the history of the house and bring it into the future with an eclectic vibe that combines the old and new, the retro with the modern that works together in a symbiotic and aesthetically pleasing way. 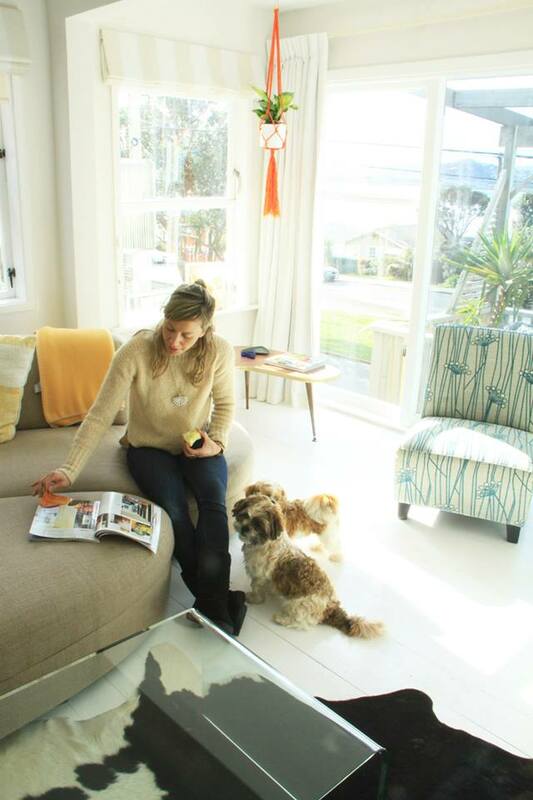 Our brief and mood board had three key ideas “Beachy, Retro, Scandinavian” check it out on Pinterest. Again I took notes while writing the previous post around a 'Nautical' theme. We wanted to promote focus towards the ocean and maximize the views, so introduced beach influenced colors and accessories. 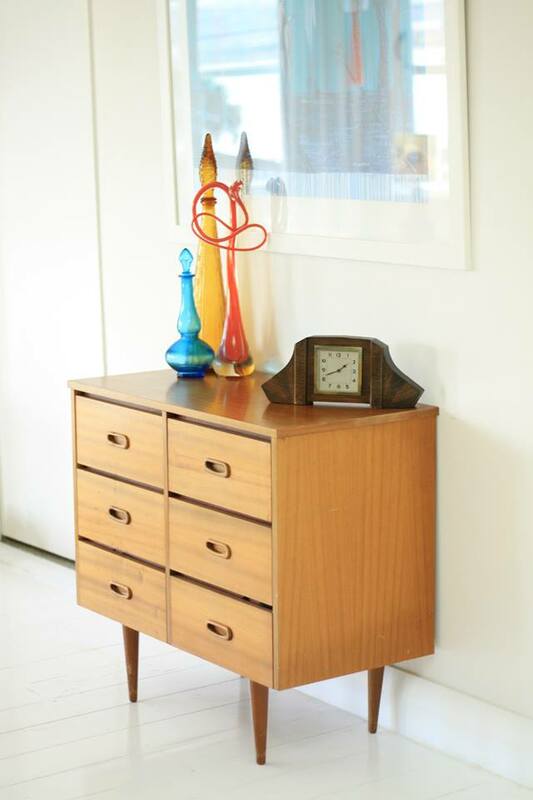 Our retro, mid-century influence came about because we love the aesthetic of this era (and Mad Men) and because we’re on a budget with a bit of perseverance at local opportunity shops and Trademe (like eBay) we found some beautiful bargains. To enlarge the space we went white from floors to ceiling to create a blank canvas to lighten and brighten. 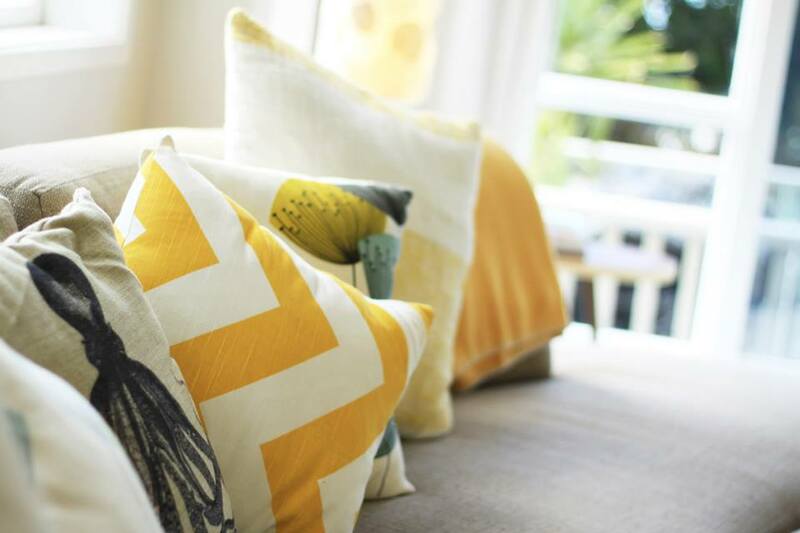 To avoid the living room and kitchen feeling too cold and clinical, we introduced soft furnishings, textures and bright colors via ornaments, cushions, art, books, rugs, throws and a leather pouf. 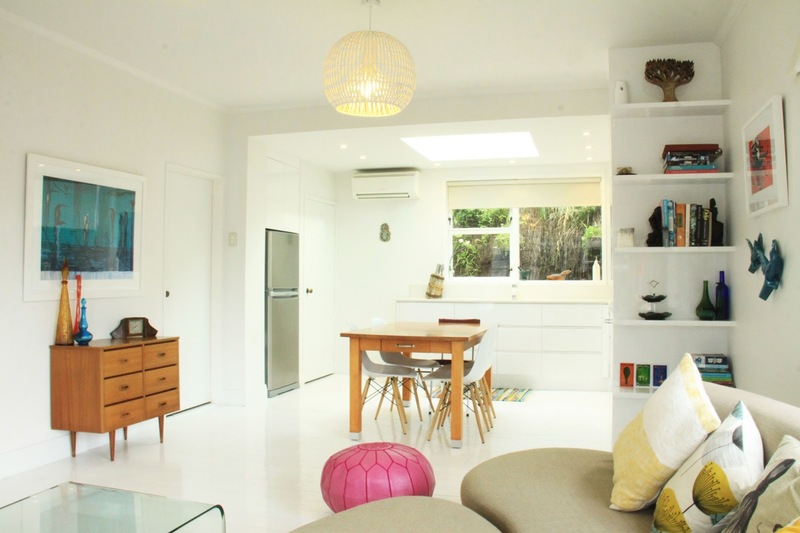 The white painted semi-gloss floorboards are a dramatic feature. Although it’s a common idea I've seen in magazines and blogs, I’d never seen it firsthand. So it was a bit of a risk, but well worth it. I kept the original Matai (native NZ wood) T&G floor boards that reflect the history of the home and I love that you can see the wear and tear of the floors through its white polyurethane face lift. All white blank canvas with pop of pink color thanks to our awesome leather pouf from LetLiv. A white dress also acts as a fantastic blank canvas, bright pink is a fun, warm and feminine touch. Blank white canvas with a pop of orange. Your eyes are naturally drawn to the orange in both of these images. 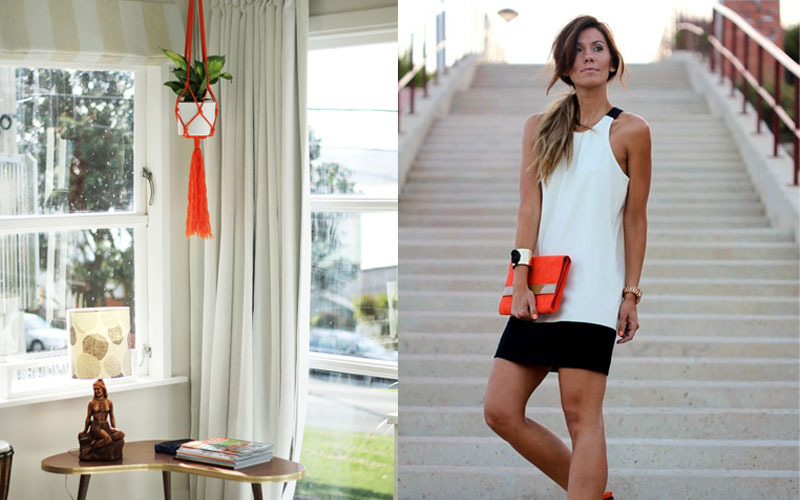 The plain white and black dress make the orange purse a real statement and focus of the outfit, as with the macrame plant holder. You don't need to spend a lot of money to add color, I painted these salt and pepper shakers, and of course lemons you can buy week to week and I use them for cooking virtually everything. The BEFORE photo - view from kitchen to living room. The AFTER shot, whiter and brighter. Lighting – our lighting options were quite strategic – the main living room shades are beachy and cast brilliant streams of light across the ceiling. 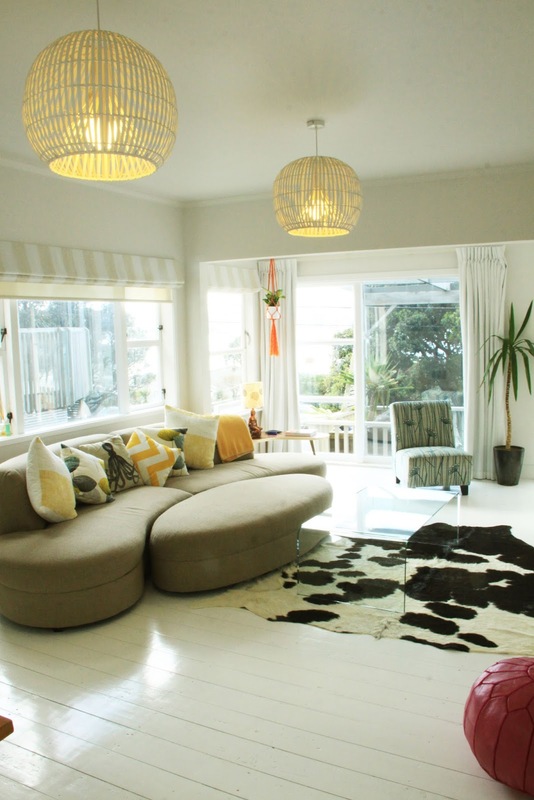 Cowhide rug – the rug sets off the white flooring and gives the room quirky character whilst adding softness. Glass coffee table – we wanted to totally maximize the space so chose this glass coffee table that visually doesn't occupy much space whilst providing that functionality. The BEFORE photo of the kitchen. We got rid of the window to the neighbours bedroom (I'm sure they appreciated that) and took the kitchen from 90's filth to present day shine! The AFTER photo of the kitchen. 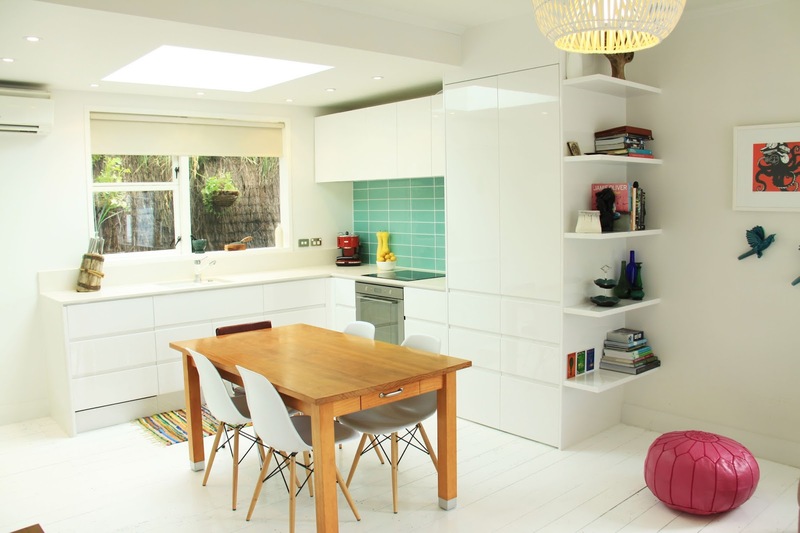 All hi-gloss white cupboards and white engineered stone bench tops. 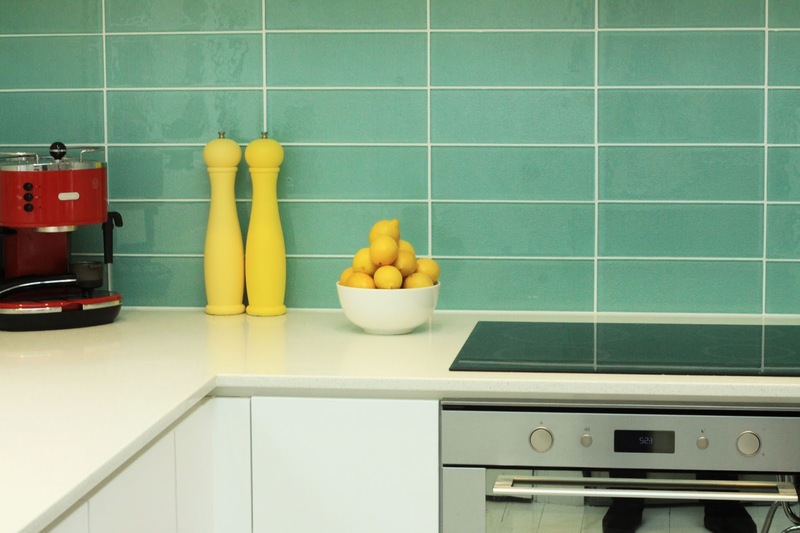 Added color with the aqua tiles and yellow accessories. The AFTER shot, from living room into the kitchen. White floors, walls and ceiling. The floating shelves enable a smooth transition from the kitchen and dining space into the living space. 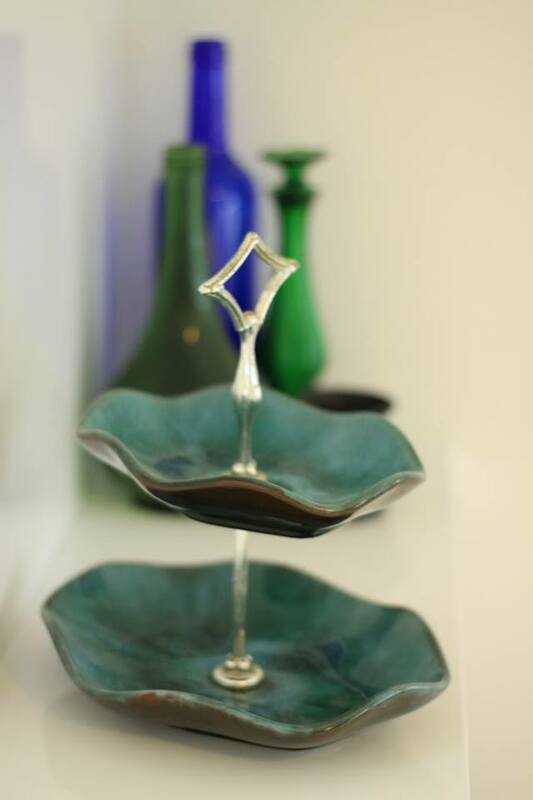 They also provide the opportunity to display beautiful objects and again more color. 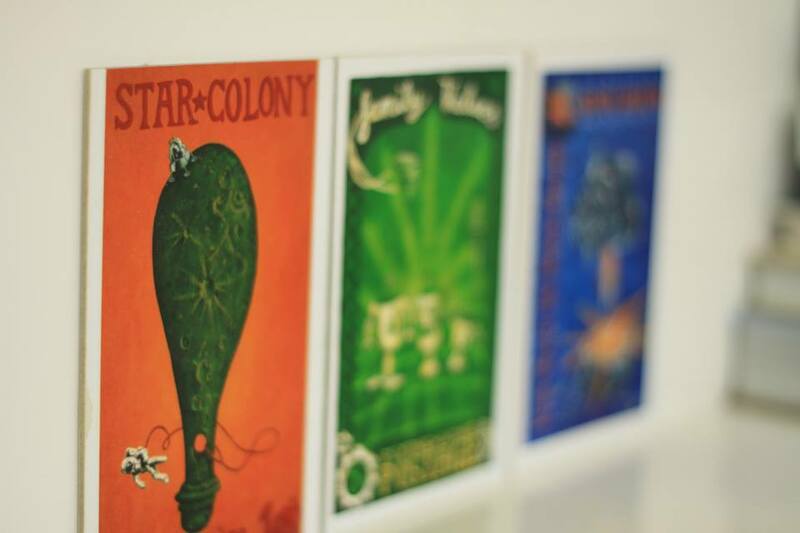 Inexpensive postcard sized art add extra color. Artwork courtesy of Sam Broad. 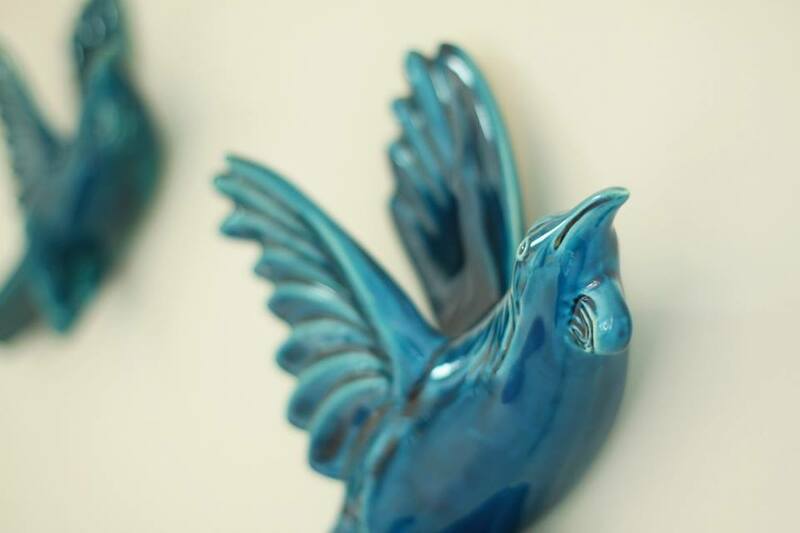 Again I inspired myself with the Tui art from Bob Steiner in a previous post and bought two birds to give more color and interest to the room. Three dimensional wall hangings are way more exciting than 2D. Everything on this drawer is second-hand, including the drawer! I'm a firm believer in the fact that you don't need a lot of money to make things look good, just a bit of patience and time to dig around for bargains. Blue mountain cake tier, another Trademe bargain. 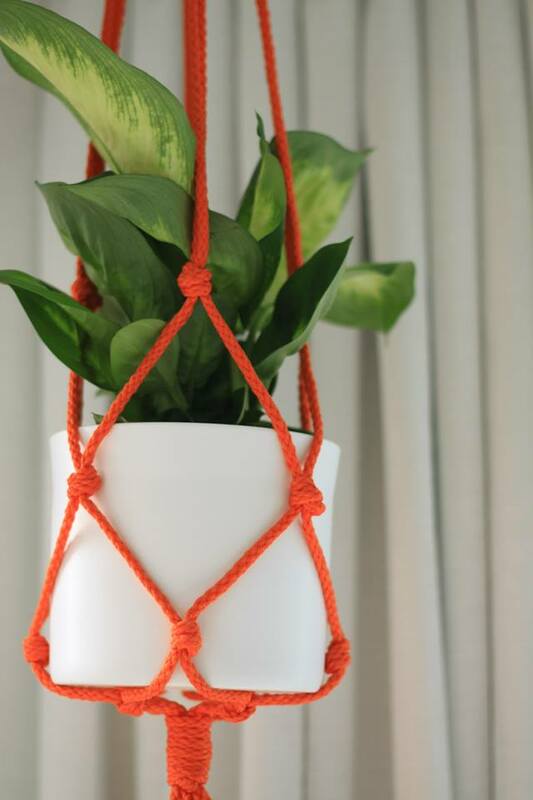 Bright orange macrame plant holder, I made this myself! Check here for an easy tutorial. We've tried to maximize the views to the sea. The white book shelf blends in and lets the books and decor stand out. Check the nautical accessories of the shell lamp and the glass buoys. The colorful rug was super cheap, $15 from a local importer. These common Indian rag rugs give the necessary color and texture without the expensive price tag. Our puppies Sookie and Brian also add to the soft furnishings. I hope you're inspired to try all white, whether its interiors or an outfit for a day. 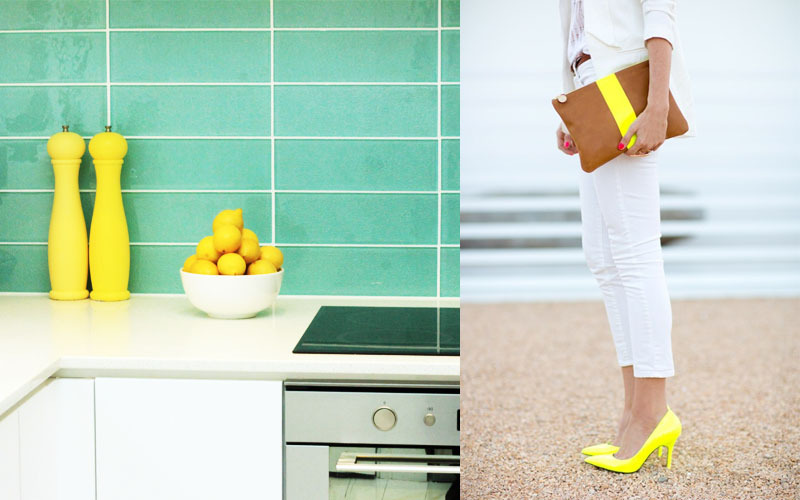 Make a statement with a blank white canvas and go bold and bright with accessories. You have made a wonderful job of your home! Did you do the floors yourself or get a tradesman in? I'm struggling to find anyone in Wellington who can confidently say they can turn my floors white! 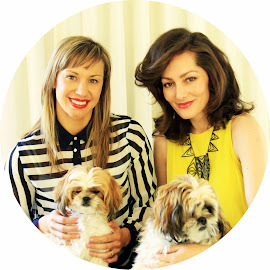 Hi Jodi, thanks so much for your lovely comment :) We didn't do the floors ourselves, we're not that handy! We got a guy Kim from Four Star Flooring to do it - http://www.4starflooring.co.nz/ The process was sanding first then first coat with clear polyurethane, then two coats afterwards of a special hard wearing white polyurethane coating. I hope that helps! HI, like what you have done. where did you get the lights for the living area? we're sruggling to find lights we really love.